Businesses, it seems, have squeezed the entire commercial potential of Facebook in the last few years. Reports suggest that there has been a 63% decrease in organic marketing reach since 2012 on Facebook. The world’s largest social network, in all probability, has plateaued. The decline of Facebook has led to a mad rush by brands to find the next big social network. And it is not without a sense of irony that this new social network is owned by Facebook! We are talking about Instagram. And by all accounts, it is just getting warmed up. This visually-led social network has 500 million users, 300 million of which use Instagram daily, at last count, making it the fastest growing social network in the world. Launched in October, 2010, it was bought by Facebook at a whopping $1 billion within a year and a half. The amount Facebook closed this deal at was scoffed by most experts, but Zuckerberg, it seems, had the last laugh. Although Instagram does not offer any business-specific features, it hasn’t dissuaded 93% of premier brands that are active on Instagram. Many smaller brands, especially, e-commerce, have made Instagram their own. With a 115% increase in organic marketing reach since 2012, Instagram has become a darling of brands. Apart from the massive difference in organic marketing reach of the two social networks, more than twice the number of Instagrammers engages with brands as compared to Facebook users. Instagram has 58x more engagement per follower than Facebook. While brands on Facebook reach 6% of their followers per post, brands on Instagram reach 100% of their followers per post. Also while the average order value on Facebook was $55, it was $65 on Instagram. User statistics on Instagram are just as mind-boggling. So how does an e-commerce brand that relies so heavily on product pictures use Instagram that does not allow use of copy or links to online stores? 1. No external links? No problem. Use hashtags instead! The biggest challenge with Instagram is that it does not recognize links that takes a user outside of its cozy environs. For an e-commerce store, this could be the biggest problem as there is no way it can guide users to its online store. You can only have links in your profile. Without links, hashtags are your best friends. Judicious use of hashtags help you organize your posts and make them noticeable to Instagrammers. If you are a fledgling entity on Instagram, use hashtags to get your pictures noticed. 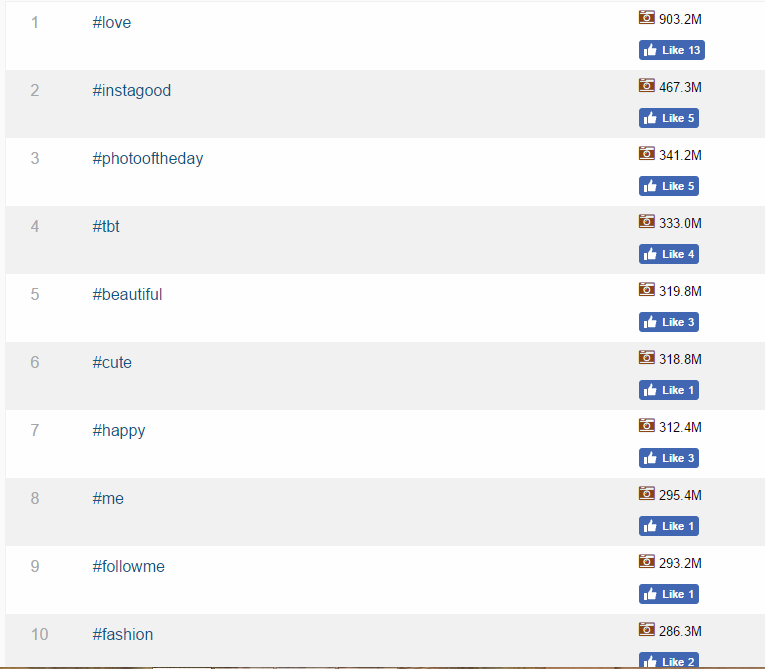 Find out the hottest hashtags on Instagram and use them for your brand. Once you garner a good number of followers, you can shift your strategy to focus more on pictures. A hashtag becomes a link to your brand. All your posts featuring a particular hashtag will be displayed at a single place. 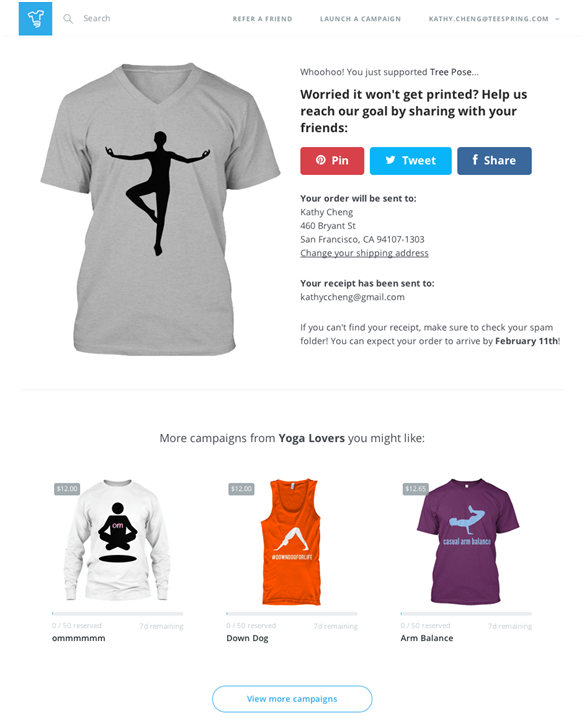 Thus, you can now showcase your products in one place. You can also invite users to submit pictures using a particular tag and they all will appear in one place. 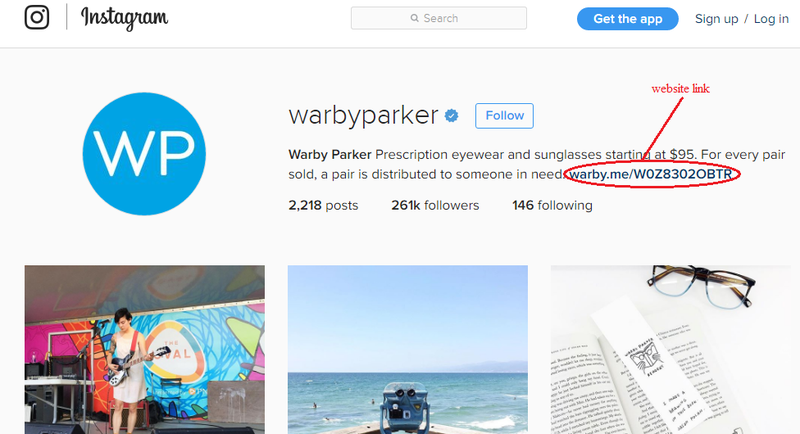 Influencers can turbo-charge your marketing on Instagram. 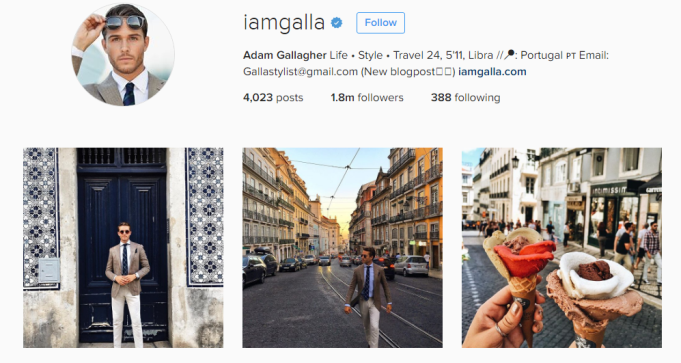 The most popular industries on Instagram have influencers – those who have a ton of followers. Fashion, cosmetics, personal care, food and alcohol are among the industries that have a high number of influencers. A bit of research into whom your target market follows and you can approach them to help you. The best way is to get them to post a picture wearing (or using) your product and a hashtag, and voila! You have a campaign on your hands. The bigger influencers will very likely expect to be paid while some smaller ones (having a fan base of a few thousand) will be happy with a free product sample. Choose your influencer depending on what you want to offer in return. Being a purely visual channel, Instagram poses many challenges for businesses looking to engage with their audience. It’s like selling without a copy, as Jim Squires, Instagram’s director of market operations puts it. He advises brands to be creative and use Instagram’s existing features to build an awesome user experience. “Fit in to stand out,” is what he tells marketers. 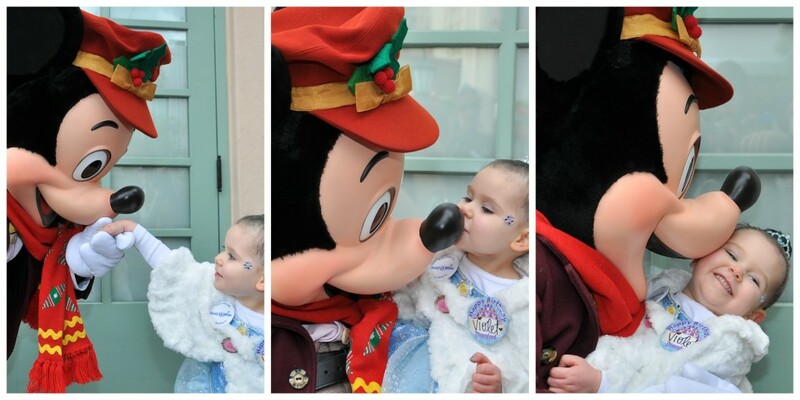 The brands that have been successful the most are the ones that use beautiful photos that elicit emotions. Use lifestyle photos of your products. Instead of studio pictures, ask users to submit their own pictures using/wearing your products. 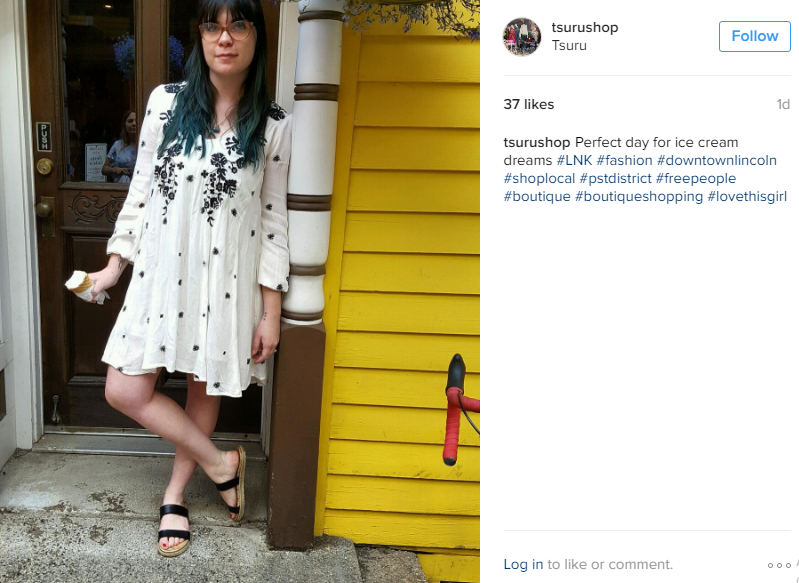 Take a look at how Tsuru, a local clothing retailer uses customer-generated content for promotion of its products. Instagram is also not following the Facebook route towards allowing explicit ads. It has set very strict rules for brands to follow. Instagram Direct is a way to send photo and video messages and can be used creatively by e-commerce brands. Brands can now share photos and 15-second videos and share it with their audience. You can use Direct to announce the launch of a new product. Since Direct only allows you to send a photo or video to 15 followers at a time, you can use this strategy to give a sneak peek to a select bunch of really engaged users. You can also use Direct to gift coupons to your best followers. You can select the followers that comment on, like and share your posts frequently and send them the photo with the gift code that they can use for their next shopping. Direct also allows brands to chat with their followers. Holding a Q&A with followers gives you a great opportunity to get feedback and educate them. You can also target specific demographics using Direct that allows you to send your message to a select audience. This is a great way to do brand research. The Search and Explore feature in Instagram is an intuitive way that is used to serve relevant content to users depending upon their preferences. This is a non-invasive way and what content will be served depends upon any factors including the people one follows or the posts one likes. In April this year, Instagram launched video channels in Explore. They’ve realized the popularity of videos among users and through this feature they’ll make it easier for users to discover relevant videos. This offers a fabulous opportunity for brands to create awesome video content and reach a wider audience – people who do not yet follow them. According to Instagram, Explore gets better by adjusting to your preferences and shows you more content that you’ll enjoy. So you may consider it as free promotion of your content by Instagram! This is a great way to create awesome videos and let Instagram serve it to the right people. Contests are popular ways to engage users and drive attention. Everybody loves the chance of winning a prize in a contest. To make a hashtag trending, tie it with a giveaway or contest. 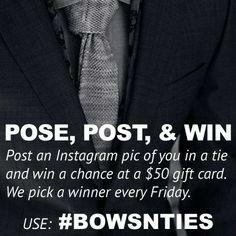 Take a look at this simple content run by Bows-N-Ties. The most important part of the contest is to choose the right hashtag, one that is, preferably, your brand name and which is not already in use. Set the scope for the contest (what kind of picture, whether it has to be your products, which hashtags to be included, etc.). Finally, set the reward. A recurring reward is better than a one-off contest as it keeps the hashtag alive and you get a continuous steam of user-generated content. On August 2, 2016, Instagram announced the launch of Instagram Stories. Most experts believe that this is to counter the growing popularity of Snapchat and Instagram is pulling all plugs to retain its leader tag. Instagram CEO, Kevin Systrom even admitted that the credit for introducing the “stories” format goes to Snapchat. This feature lets you share photos and videos without posting them to your profile. Your entire 24 hours will be packed in a slideshow format – your story. The story remains “alive” for 24 hours. This is another exciting opportunity for brands to be as creative as they can and create brand stories that will increase user interest and engagement. Brands can upload photos and add effects like neon marker, brush tool, pen. They can increase the visual appeal by selecting various colors from the palette. Brands can also use Boomerangs and Hyperlapses and add them to the story to make it more enticing. Iconosquare – With this software, a small, dedicated team can easily manage a company’s Instagram account. A platform is created on your desktop which shows you your feed and what followers are posting. A powerful search functionality and statistics help you manage your account like a breeze. Offerpop – They have a unique photo contest builder that you can use to create exciting contests on Instagram. 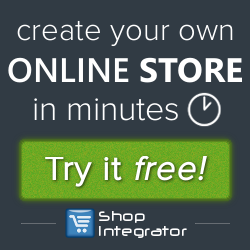 InstaOrders – With this software, you can create a free e-commerce store on your Instagram account. This allows shoppers to directly place orders on Instagram. 10sec – This is a free flea market app that you can use to sell your products on Instagram. From making a listing to shipping an item to depositing money in your account, 10sec does it all. Instagram has struck the right balance – helping brands to tell their stories and engage customers, without being too invasive. It still is a very personal social network, unlike Facebook. It has managed to create the right mix of social and commerce. The visual impact of this platform makes it creatively challenging for brands to create brand stories and yet gives them the perfect opportunity to engage better with its audience by allowing user-generated content on their profiles. Even B2B marketers are using Instagram successfully. So it should hardly come as a surprise that e-commerce brands are using this exciting platform to generate a buzz around their products. We hope that the above-mentioned marketing ideas will inspire you to creatively engage with your audience on Instagram. There is little doubt that email is an invaluable tool for small business ecommerce. It is cost-effective, flexible and executed properly can offer you great ROI. Of course email is only as good as the quality of email addresses that you hold. Therefore building and maintaining your own email list is essential. Buying in cold-lists are an option, but they are unlikely to give you the response rate your own in-house list will provide. You also need to remember that all databases decay over time so you need to be continuously looking at ways to maintain your list and add new prospects. Growing your own list should be an integral part of your email strategy. The good news is that there are plenty of things you can do as small business to capture new email addresses. It helps if you look at growing your list on a continuous basis and as part of your overall marketing strategy. OK, lets start with content. Although content itself isn’t going to physically provide you with an email address, it is integral to your success online. If your business isn’t appealing to customers and potential customers why on earth would anyone want to impart their personal details. All your content, whether on your website, social media platforms, blog or in your newsletter, should inspire people to want to frequent your website, learn more about your business and keep in touch – and ultimately part with their contact details. Having a blog is one of the most successful ways to generate regular, relevant content to your website. If your posts are interesting and relevant to your target audience, the more likely visitors will keep coming back to your see your articles. Moreover, if they like what they see then they may well decide to handover their email addresses so you can inform them when your next post is being published. Take a look at Hello Fresh’s blog page. Packed with lots of great posts that are relevant and interesting to their target audience, they have a clear sign-up box encouraging visitors to leave their email address so they can email them their latest post as and when it’s published. 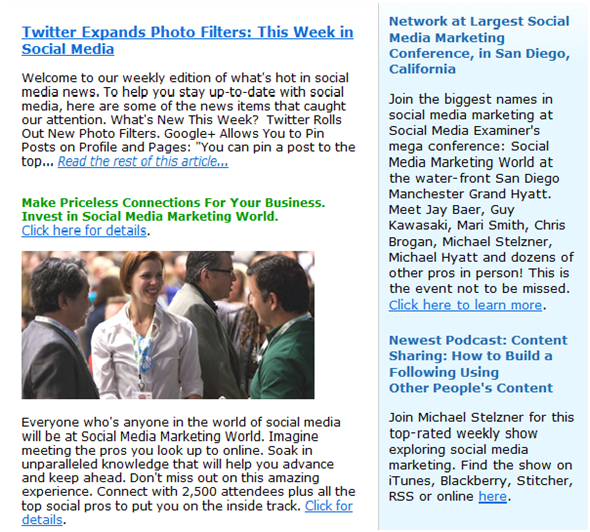 Email newsletters are a great way to keep in touch with potential customers. If customers are interested in your products and services they may well be inclined to provide you with their email address. Your newsletter needs to contain information that is interesting, entertaining and relevant (after all, you don’t want them to unsubscribe). Have a clear newsletter sign-up form on your website and consider a pop-up box. Don’t be tempted to ask for too much information up-front. Unless you are are offering high value information (which we’ll come onto next) an email address and maybe first name will suffice. The more information you request the less people will leave their details. Checkout notonthehighstreet.com’s sign-up form. It is clear, straight to the point and doesn’t request reams of information. 4. e-books, guides, reports and white paper downloads. Providing ‘high-value’information in a downloadable format is an effective way to obtain email addresses. This is probably more common place in B2B, but it can work well in B2C if the guide or e-book is deemed valuable or interesting. In order to access their download visitors have to leave their contact details. 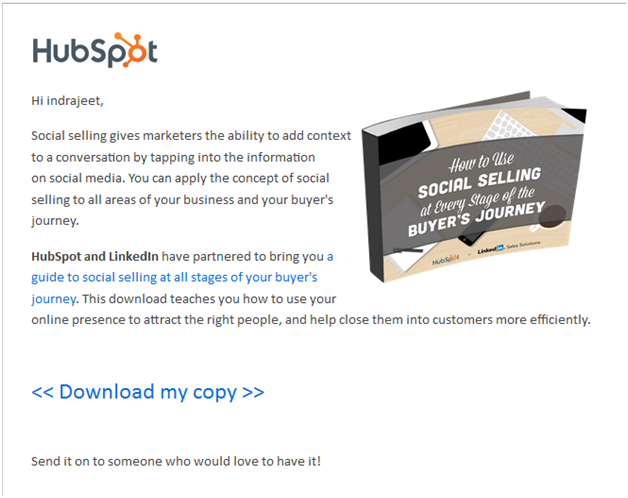 In the marketing arena, HubSpot do this really well. Take a look at the screenshots below, in addition to the download they also encourage the recipient to email the link on to friends to generate more potential signs-ups. Who doesn’t respond to an attractive incentive? Offering a bit of encouragement such as money-off, discount code, entry into a competition or a free trial can help entice visitors to sign-up. For example as soon as you go onto the Banana Republic or Gap websites you are greeted with a pop-up offering you 15% off if you share your details and sign-up to their emails. Encouraging your existing customers to recommend you to a friend is a targeted and cost-effective way to generate new names. Essentially refer a friend is encouraging your existing customers to actively recommend your product and services to friends and family. Offering an incentive to both your original contact and the friend they recommend will help lift your response. For example, see the Boden refer a friend scheme below. Using your social media platforms can help support your email communications by encouraging customers to sign up. If you’re running a competition, offering an incentive or providing a free e-book, then spread the word on social media with a link back to your sign-up form. In addition you can add a button to your social media page. For example, use one of Facebook’s ‘call to action’ buttons on your cover photo such a their Sign-Up button. This can then link back to the sign-up page on your website. Finally, don’t forget about generating prospective names when you’re out and about. If you are have a presence at an exhibition or event then ensure you have a way to collect any new names you gather. For example run a competition, have a giveaway or offer a free trial. Look after your email list as it is one of your most precious assets. Have a strategy in place to generate new names and ensure you keep your list clean and up to date. We’d love to hear your thoughts and experiences on email list building. So please do leave a comment. We’ve all received those completely pointless, repetitive and uninspiring emails from e-commerce companies, insurance firms, banks, telephone companies, the works. Nine times out of ten, we don’t even bother opening any of them. In my case, most just get marked as spam without another glance. I suspect I’m not the only one. And yet, we keep hearing these compelling statistics about email marketing. About how it’s the best converting tool in a marketer’s toolkit. About how it’s the most powerful tool to build relationships over the long term. About how it beats social media hollow in terms of ROI dollar to dollar. So what is stopping your online store from being one of these email marketing converts? Here’s a sampling of e-commerce businesses that are proving the naysayers wrong with the creativity of their email marketing. Let’s take a look. Who doesn’t like to feel a little welcome the first time they transact with a new business? A welcome mail is such a simple and effective tactic to build that first connection with your user that it amazes me how few brands invest their time into setting these up. All you need to do is set up an automated email that gives a shout out to a new user welcoming them into your fold. It helps if the welcome mail can offer the user key details about their account with you or offers tips and tricks on how to benefit from using your product. 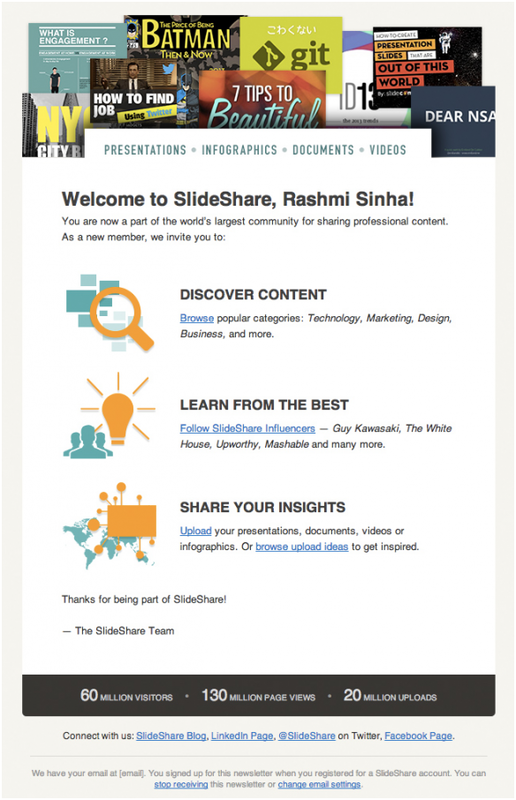 The email above from SlideShare is a great example of how welcome emails should be done. It’s personalized (makes the user feel special already), it tells the user about how she can use SlideShare and finally it reinforces a sense of being part of a larger community. Nicely done. So you’ve made your first sale. Good for you! Instead of sending your new customers the same old standard newsletter that every single one of your 500 or 5,000 or 50,000 users get; send them something that actually speaks to them. Send them handpicked products that directly complement their original purchase. A shoe maintenance kit for someone who bought shoes, a cellphone case to someone who just bought a cellphone, you get the idea. Alternately, you can interest a new user in an upgrade to their original purchase by throwing in a superb unbeatable deal. Two things to keep in mind here. One, make sure your upsell doesn’t happen minutes after the original sale. Two, the offer that you make must necessarily be an exclusive one that they would never be able to get otherwise. One of the key factors that help in making an e-commerce sale is the number and quality of customer reviews for the products that you sell. User reviews are trusted way more than all your marketing jargon combined and are a must have for any site that’s serious about selling. Set up automated emails requesting users for reviews to be sent out to within a week of the user receiving your product in the mail. The review request mail should have a direct click through link inside the email that leads the user to the reviews page. 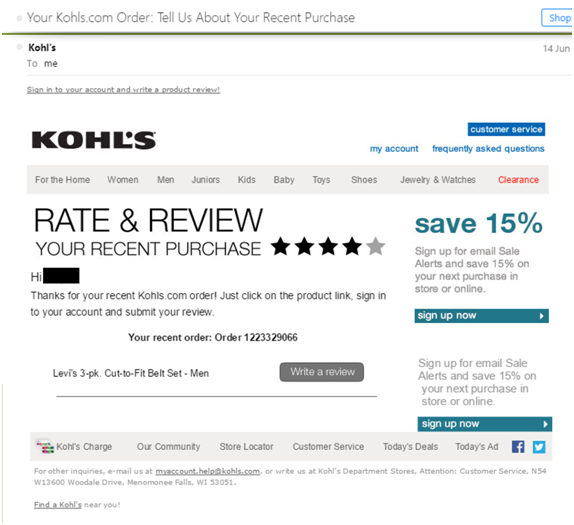 Even better, if you can allow users to write a review within your email itself and post it online directly; a la Amazon. Whatever method you choose, just remember to make the process of leaving behind a review a complete no-brainer. The easier the process, the more reviews you’ll gather. Nearly 68% of all shopping carts are abandoned by online shoppers every single day. That’s trillions of dollars in potential sales, LOST FOREVER. Break out of this cycle of attracting users to your site and then losing them to competition, by setting up your own abandoned cart rehab program. 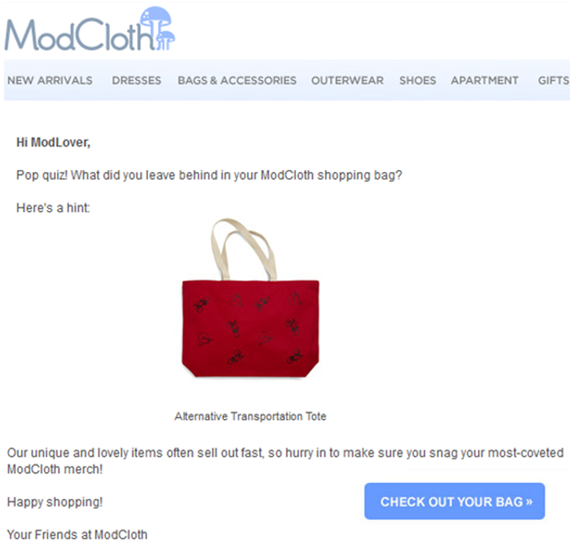 The idea is to send users a reminder of what they left behind ‘unshopped’ in their carts with a timely reminder email like the one from ModCloth below. What I especially like about this one is the fact that they included the actual item from the shopping cart in their email. This prods the user into action by tempting them with an item they liked anyway. The copy in the email also makes sure that the user feels a sense of urgency without feeling pressured into making a purchase. An abandoned cart recovery email program typically needs at least two rounds of emails to be really effective. The first email like the one above reminds the user about what they left behind in your shopping cart. The follow up email – sent typically a couple of days after the first one – should offer the user an incentive to complete the purchase. These emails cost next to nothing and help you target a staggering 70% of the people who landed on your site, tried to make a purchase by changed their minds for some reason. Go get ‘em tiger! You’ll think I’m being repetitive here, but hear (read?) me out. By reminder mails, I’m referring to those thoughtful little emails that remind you about such silly things as an upcoming payment, a subscription renewal date, a meeting or appointment that you set up and so on. Google Inbox, anyone? Reminder emails pre-empt the user from straying away from your brand by renewing their subscriptions on time or by ensuring they engage with your brand as planned (see the KISSMetrics example above). So they prevent churn and increase engagement, what’s not to love about them? We’ve all received emails from random businesses that have our date of birth wishing us a ‘Happy Birthday’ or getting Christmas greetings from more people than your inbox can handle. What happens to most of them? You’re right, straight to the trashcan they go. For a change, stop being such a cliche and send out emails for occasions when you have no competition, occasions where your email stands out. Send an email for your customer’s first anniversary with your brand. That’s got to be pretty unique, right? Send out an email for World Environment Day. Or International Women’s Day. Or whatever else relates to both your brand and your customer. A quirky image that really grabs the eyeballs is a good investment in your ‘special occasion’ emails. And don’t worry, those pictures don’t always have to cost a fortune. A copyright-free resource like IM Free offers businesses thousands of professional images that you can modify and re-use under an open Creative Commons license. The idea is connect with the user on special occasions – occasions when they least expect it, occasions that help your brand stand out. And if you DO have to go down that cheesy route of birthday emails, make sure that your email gives your customer something truly special like Payless does in their email above; not just a measly ‘Happy Birthday’! This is SUCH low hanging fruit, that it’s truly amazing why more companies don’t use it. A note from the CEO or Chairman of a company – any company – to an individual customer tells him that he’s important. It tells him that the company knows about him personally and takes an interest in him on a one on one basis. It’s not surprising then, that emails with subject lines like ‘Note from our CEO’ get far better open rates than business as usual emails. 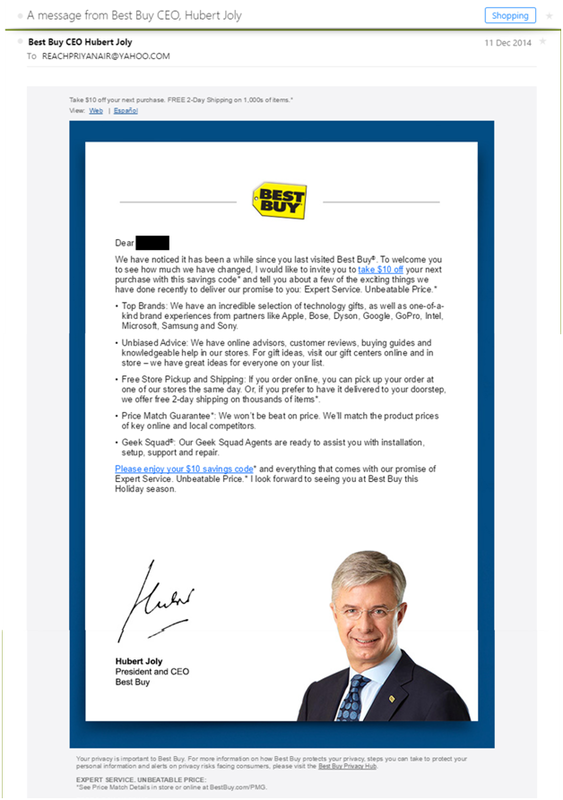 BestBuy sends a note from their CEO Hubert Joly as a means of reaching out to a lapsed customer. The email takes on the role of a personal letter trying to convince the user to buy from BestBuy once again. A signature and a headshot along with a personalized salutation at the beginning of the email complete the effect. Remember, this is a one-off tool that you can use for high impact activities. Sending out a letter from the CEO every week dilutes the weight of the email and makes it just another email that heads straight to trash. The list of companies that have grown from zero to millions of subscribers on the back of a strong referral program is legendary. Research has shown over and over again that recommendations from family and friends is the strongest influencer in making a purchase for the largest majority of customers. A referral program taps into two things to get a new customer. A recent example of a referral program that was a runaway success is DropBox. Visakan Veeraswamy describes the meteoric rise of DropBox through its referral program alone. 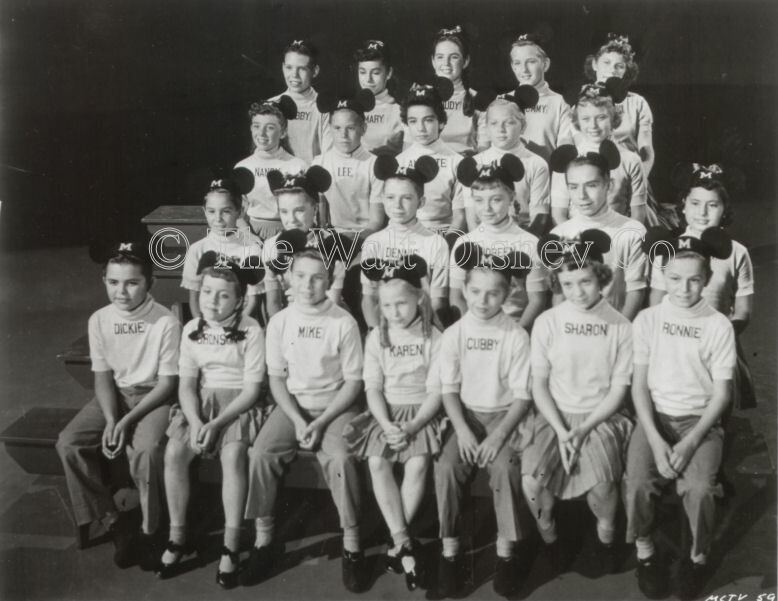 The company grew from 100,000 users to 4 million users in little over a year. The smart thing about DropBox’s referral strategy was the incentive it chose to give out for every referral. Customers who brought in a friend into the DropBox fold were rewarded with more storage space, thus increasing their current usage of the service automatically. 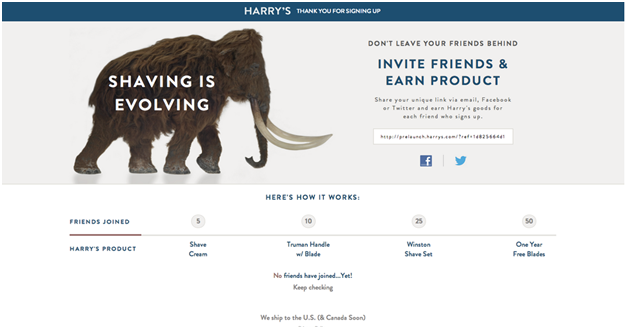 In the referral email above, Harry’s doesn’t just offer the user a one-time referral reward. They create a timeline for the referrer showing them the incremental gains to be had each time they keep referring more and more customers to their site. What a great way to turn an existing customer into an affiliate marketer on the sly! OK, so let’s admit it. Some days are so bad, all you need to see is that cash register go ring-a-ding-a-ding to put a smile on your face. 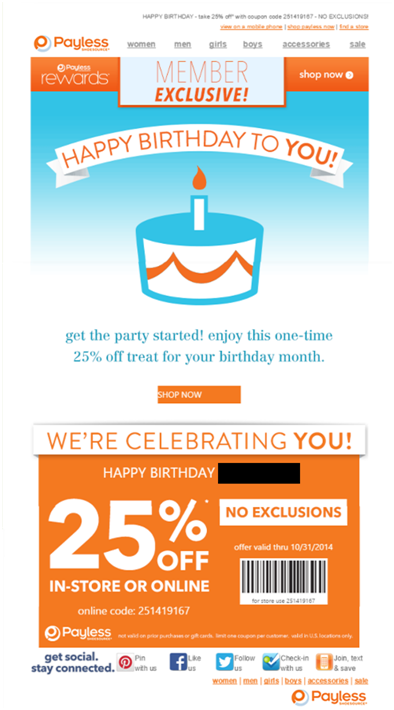 Nothing beats an email with a generous coupon for instant gratification of the e-commerce kind. While you may send out special offers and deals every now and then with your regular newsletters to your subscribers, you can opt for an email only coupon that beats any other offer out there hollow. The idea is to generate revenue and generate it FAST. Take a look at the Old Navy email above. While they do talk about their regular deals and offers, the crux of this email is clear. There is a ‘one day only’ offer that is the spotlight of this email with a discount so deep, it’s irresistible. This discount combined with the limited time period of the offer make this email a winner in terms of instant sales. E-commerce marketers like you and me need not spend thousands of dollars every month on platforms whose returns are nebulous at best, like social media. In the process, we often tend to miss out on the low hanging fruit like email marketing. Make 2015 the year of zero missed opportunities. Make it the year of smart email marketing! If you are a small business owner and haven’t yet got around to planning your marketing and marketing spend for the year ahead then now is the time to get started. You may feel that creating a marketing plan and setting a marketing budget is a time-consuming exercise and only really useful for businesses with extensive marketing departments and large budgets. On the contrary, taking the time to put together a marketing plan and marketing budget now will save you time, money and potential headaches later on in the year. It is just as important that as a small business owner you plan the best way to spend your budget and that will mean putting precious time aside to do just that. A smart budget will help you make the most of a small pool of money by planning and tracking spend to ensure wastage is kept to a minimum – essential, if like most small businesses owners you need to make every penny count. What should I set as my marketing budget? What time you can give (are you planning to outsource or will all the marketing be done by you)? So before coming up with a figure, first take some time out to plan and think about the following questions: How is your business performing at the moment? What could you do better? What is it you want to achieve in the year ahead? Planning is absolutely essentially to creating an effective, controlled marketing budget. It will eliminate waste and ensure you are making the most of your marketing spend. How do you get there (strategy)? How exactly do you get there (tactics)? How will you monitor performance? Of course how detailed you go in your marketing plan is up to you and will probably depend on how much time and resources you have available. But by following a marketing planning model such as this and thinking about the questions it raises will help you focus on the best way to drive your business forward. An effective marketing budget is essentially a smart budget that gives you flexibility, keeps you in control of your spend and results in very little wastage. Your marketing budget is an integral part of your marketing plan and helps you outline the costs of achieving the goals you have laid out within the timeframe you have planned. Of course the budget you set will depend on what you have to spend and what you are trying to accomplish as a business. A marketing plan and marketing budget will help you stay savvy and smart in the way you spend you money. Monitoring and maintaining your budget will help give you flexibility in terms of spending by enabling you to cross check your results against spend. For example if a promotion isn’t working you can stop it and quickly move your spend over to a more effective activity. Considerations: What should you include in your marketing budget? This is why marketing planning is so critical, if you’ve properly planned for the year ahead then you should have everything covered. Your marketing budget should be broken down to reflect the details of your marketing plan. Here is a bit of a checklist to help get you started. It is in no way exhaustive and some activities won’t be relevant to your business but it will get you thinking of all the different areas you may need to cover to avoid any nasty surprises from unexpected costs. And remember there are always unexpected costs that crop up so putting some contingency aside is not a bad idea. There are plenty of useful marketing budget templates you can find online to use as a guide – from basic to all singing all dancing spreadsheets. I’ve added a few links below to templates I have come across online that you may find useful. Alternatively create a simple excel spreadsheet yourself outlining your planned marketing spend for the year ahead. A simple, effective way to monitor and control spend is to have a monthly breakdown of planned marketing activities with estimated costs against actual costs. This way you can have a clear analysis of spend against activity and can quickly see where you have overspent , underspent and enable you to monitor your potential ROI for each activity. Don’t forget an effective, well thought out marketing budget enables you to spend smartly and get the most from your hard-earned money. We’d love to hear your thoughts and experiences on this subject, so please do leave a comment. Email marketing is one of the oldest internet marketing techniques. It’s been around for ages. If you think, sending emails to promote your products/services is an anachronism of a bygone era, you couldn’t be more wrong. Emails are still a very effective way to attract and retain customers. 56% of respondents say email marketing is very effective for customer retention. 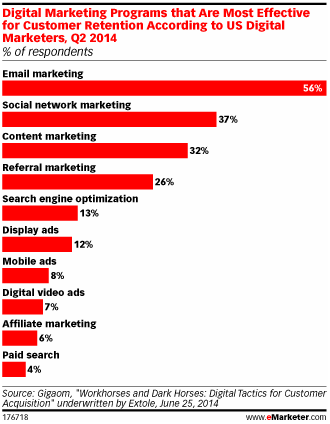 Marketers also believe emails are the most effective model for revenue generation. These figures leave very little room for doubt that the “humble” email, for long considered to be the old marketing workhorse, is as effective today as it was a few years ago. The efficiency and deliverability of email marketing hasn’t dulled one little bit in spite of the arrival of other tactics like content and social media marketing. But there is a problem. With over a 100 billion emails being sent and received every day, the construct of your email assumes tremendous importance. You can’t just send any email to your target customers. You need to send an actionable email that makes people want to buy your products or services. As can be imagined, this is easier said than done. But, if you want to leverage the immense potential of email marketing, you can’t just send any email to your target customers; you need to send emails that work. Send a mail if you really have something important to say to your target customers, for e.g. you’ve got a new product you want to introduce, a fantastic video chat lined up or something else. The Inc. mail is talking about an amazing event that has been planned. 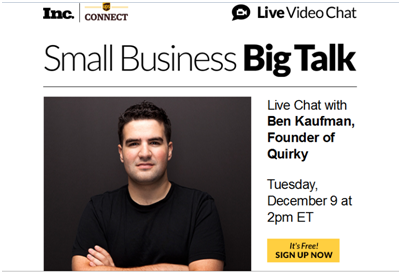 It is a video chat with the founder of Quirky, and it’s free! The mail makes its point brilliantly, without going overboard. Its design is clean and professional looking and has an understated appeal about it. The key here is to make your point in a manner that encourages recipients to take action. The focus must be on ‘conversion’. If you take a look at the example of the Inc. email, you will find that readers will want to ‘sign up’ for the video chat. The text and use of images is right on the ball. Its design and wording is absolutely perfect. If you are sending an email about special offers, make sure the best offers are clearly displayed in the mail. This is the kind of actionable email that has a higher chance of bringing customers to your website or even physical store. You will do well to remember that your target customers don’t have all the time in the world to go through your mail; what’s more, you are not the only seller sending them emails about product offers and discounts. So, it’s important you are able to make your point quickly and effectively. A no-nonsense reminder email about a special offer that is about to end should be sent to people on your email list. Reinforce the USP of the offer without beating about the bush and end the mail with a link to the offer. Such mails are simple, straightforward and make their point quickly. You don’t have to make a song and dance about a reminder. 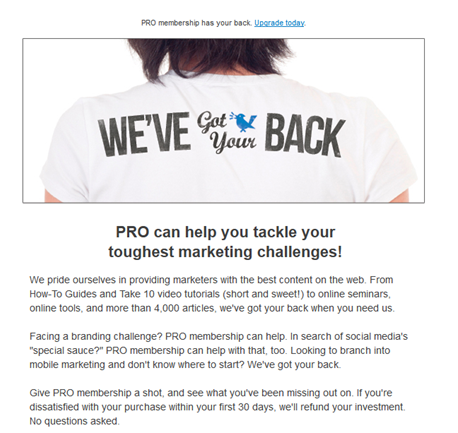 The Copyblogger mail makes its point in three lines. All one needs to do is glance at the mail to find out what it wants to say. It’s a text book example of a reminder mail. This email illustrates the importance of an email subject line. The words ‘Last Chance to Register’ create a sense of urgency and a fear of missing out on a great offer. 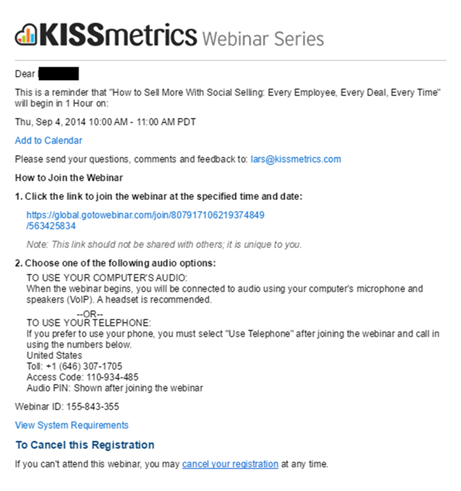 The email copy talks about the offer (chance to attend a webinar) and what’s it all about. The idea is to make sure the recipient gives your mail a reading if he/she hasn’t done so earlier. Never stop trying to sell a product/ service to somebody who you feel will be interested in it. But how do you make sure your emails don’t put the recipient off? You can do this by ensuring your emails reinforce the point made in the earlier emails. Think of it as progressive reinforcement. This makes it easy for your mails to make a degree of sense to the recipient. One of the best times to send an email is during the holiday season, when your customers are looking for products that could be gifted to friends or family. 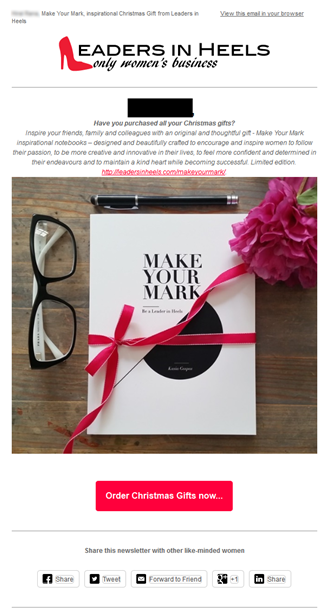 If you are selling products/services specifically designed for the holiday season, send a mail like the one ‘Leaders in Heels’ sent its target customers. The mail includes an image of the product, a description that says why it’s a perfect pick for the holiday season and a link that takes readers to the ‘buy’ page. As a business, you need to continuously explore new avenues that help you sell your products and services; the holiday season is a recurring avenue that shouldn’t be missed at all costs. If you are a products-based business, you could sell products that make for ideal gifts; on the other hand, if you are selling specific services then a special holiday discount on some or all your services will be a very good idea. 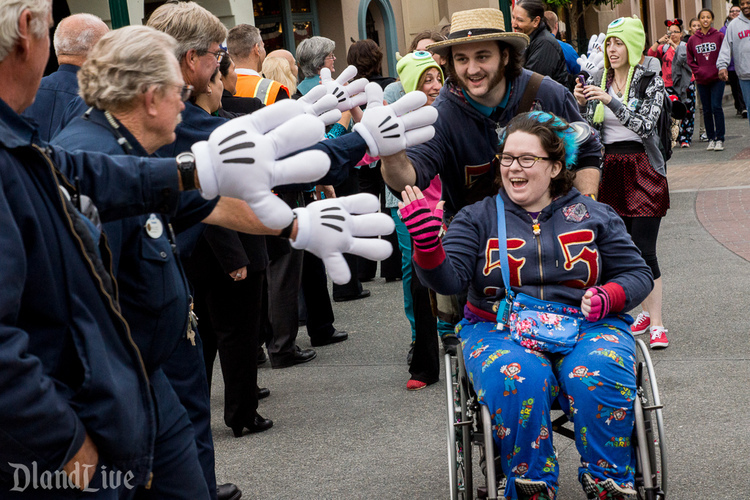 How you go about making the most of your holiday season is your call, but do it you must. And in email, you have a potent medium that will successfully put your holiday products/services offerings in front of your customers. If somebody is showing interest in your products and services, send a welcome mail. It should include links to the download page (or products page) and also a ‘how-to’ page that offers detailed information about product functionality. 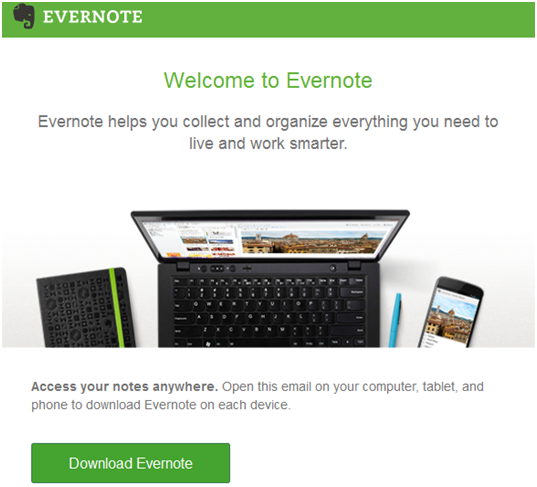 Evernote follows up the welcome mail with a series of ‘tip mails’ that help first time users create their first Note and also optimize the use of this suite of software and services. The idea here is to help users become more conversant with the functionality of your products. You don’t want a scenario wherein a target user’s interest in your product turns into frustration, just because he/she is unable to optimize its use. A business needs to engage with its existing and potential customers regularly. If you are running a business, it’s difficult to come up with new product/services or send a personalized discount offer all the time. The next best thing is to send useful, actionable niche centric information in the form of a freebie. It could take the form of free eBook, guide, video or podcast. 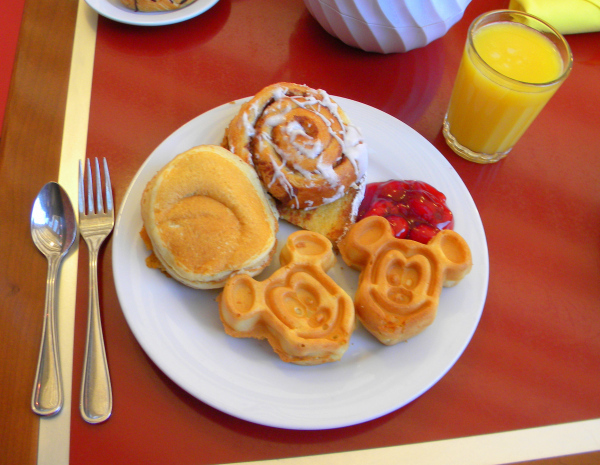 Such freebies can boost your reputation and increase the trust factor in your brand. The more such freebies land up in your customers’ inbox, the better it will be for your brand’s awareness and reputation. What you are also doing by sending such mails is telling your customers that you are not only interested in selling to them but also want to help improve their knowledge base; you are also interested in helping them take better business decisions. At the end of the day, it is trust and reputation that will help in customer acquisition and retention. One of the ways you can use emails to regularly engage with your business’s target audience is by sending a weekly/monthly newsletter. This newsletter can include information about the latest product launches, discount offers and also the latest happenings in your niche. The key is to make your newsletters as interesting as possible. You want them to be read and the stories in them to be shared. You don’t want them to be ignored. Coming up with an interesting and extremely readable newsletter every week, or month, isn’t easy. You need to think of it strategically and cannot afford to take this task lightly. Your marketing team needs to sit down with your content writers to brainstorm ideas. These ideas need to be worked out keeping the needs of your target audience in mind. Think of your newsletters as ‘solutions providers’; thinking of them as marketing material will just make them one dimensional. Try and make your newsletters as multidimensional as possible. This will ensure your target audience looks forward to your newsletters. Don’t confuse this with a reminder mail. This one starts off with the assumption that the recipient must have missed out on signing up for a particular service (read solution) or buying a particular product. Now, one of the reasons why this happens is they were not interested in your product or service in the first place. But that was then and there is a good chance that circumstances have changed; your product/services can make more sense to them now than they did earlier. There is no harm in sending a mail talking about the recipient having missed an opportunity to use your product/service and the fact that it is still available to them. Such mails make a great deal of sense if they are backed by solid evidence that the recipients are actually interested in using your product/service. Think of a scenario where a potential customer has signed up for a free service, but you want to get him to sign on for its paid version. You need to keep reminding that person the paid version is a sound investment and can deliver high ROI. The fact is that your target customers will sign up for different free services they believe will help their business in some form or other. If you don’t remind them to try the paid version of your service, they might continue to use the free version; and if and when they do decide to try out a paid version of a service, that particular service might not be yours; some other provider might have beaten you to the finishing line because he might have sent those ‘rethink’ emails, which you hadn’t. It’s important to remember that when a customer finally makes a decision to sign up for a paid service he chooses the service provider who’s been making a solid case for the paid service. If you are not sending in these emails to your existing and potential customers, you are missing out on a huge opportunity to grow your sales. If you belong to a school of thought that sending emails is an outdated marketing tactic, its time you rethink and start implementing a well-defined email marketing strategy. You will soon realize that emails are a great way of adding new customers and retaining old ones. The great part about using emails is that their scope is not limited. You can craft them the way they fit and in a way that you believe will deliver maximum returns. This is what makes email marketing so special and is a big reason why it has stood the test of time as a marketing tactic. What does it take to create a good online advertisement? How do you successfully fill an empty space of say 300 x 250 pixels with engaging and informative content that culminates in a successful click-through to your landing page? Delivering your promotional messages through online advertising needs more thought than you’d initially think, especially considering the often limited size you’ve got to work with. So we’ve put together 10 top tips to help you create effective online advertisements. Once you start advertising your business online you’ll come across all sorts of terminology for different types of online ads; there is text only ads, image ads, display ads, static ads, animated ads, banner ads, leaderboards, skyscrapers, medium rectangles and so on. However whatever the size and type of ad or advertising campaign you are planning, be it on a website, blog, email or though an advertising network like Google AdSense, there are some universal criteria that can really help get your advertisements working for you. Before you even begin getting creative, you need to be clear on the purpose of your advertisement. What is it you want to achieve? Is it a brand building exercise, is it to increase sales, drive traffic or promote a new product? You’ll find once you have a specific goal it makes it far easier to create the right content. It is also important that when once you have your goal you have a clear idea of how you are going to measure success. Will it be number of click-throughs to your landing page, number of actual sales or percentage increase in traffic to your site? Who your ad aimed at is another essential consideration. Your content is likely to differ depending on the ad group you are targeting or how you intend to segment your audience. Different demographics are likely to respond differently to particular content. So think about who you are aiming your ad at and what they are most likely to find compelling and engaging. An oldie but a goodie! AIDA stands for Attention, Interest, Desire , Action and is a really useful acronym to apply to almost any kind of copy writing. So when you are thinking about the content of your online ad focus on how you will first grab attention – for example a new product or special offer; then create interest and desire – what benefit is it going to bring customers to make them want to find out more. Finally there must be a clear call to action. Following something like the AIDA model is a really helpful copywriting guide to ensuring you’ve got all your bases covered – especially if you are new to putting ads together. A surprising number of ads don’t have a clear call to action leaving consumers to guess at what it is the ad is directing them to do. You need to be clear about the purpose of your ad and have very visible call to action – for example, register now, sign up today to our special offer, trial our product , join our community, read this article or enter our competition. Of course it’s up to them whether they make the decision to take up your instructions but a strong call to action will help pull in a customer whose attention and interest you have caught. Using imagery well and only when you need it. Keep your branding consistent across all your platforms. Always include your logo and try to keep to the same font, colours as your landing page and website. 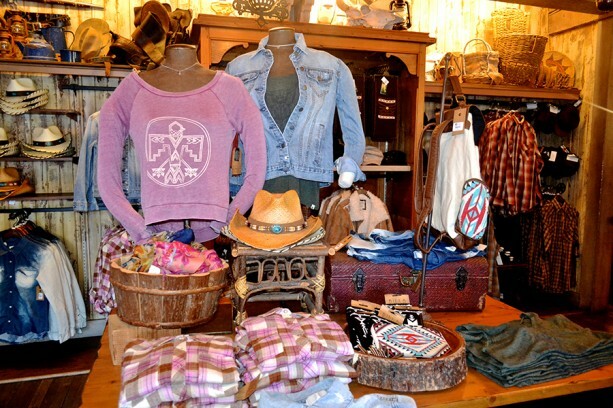 Random styles and mismatching designs are only likely to confuse customers and won’t help you with brand recognition. Your design should flow seamlessly from your advertisement to your landing page and website. Don’t mislead consumers by trying to entice them to click-through with something that actually has no bearing on the purpose of your advertisment – potential customers will simply walk away. Your advertising message should clearly reflect content of your landing page and vice versa. Clear and easy call to action. Finally, don’t forget to keep testing and measuring your ads and tweaking them accordingly. Go back to your initial goal measurements – have your ads achieved their goal? There is nothing wrong with a bit of trial and error so keep testing, measuring and tweaking to maximise your response rates.